Today's guest blogger is Ian Downard, a Senior Developer Evangelist at MapR Technologies. Ian focuses on machine learning and data engineering, and recently documented how he brought together the MapR Persistent Application Client Container (PACC) with StreamSets Data Collector and Docker to build pipelines for ingesting data into the MapR Converged Data Platform. We're reposting Ian's article here, with his kind permission. In this post I demonstrate how to integrate StreamSets Data Collector with MapR in Docker. This is made possible by the MapR Persistent Application Client Container (PACC). The fact that any application can use MapR simply by mapping /opt/mapr through Docker volumes is really powerful! Installing the PACC is a piece of cake, too. I use StreamSets Data Collector a lot for creating and visualizing data pipelines. I recently discovered that I’ve been installing Data Collector the hard way, meaning I’ve been downloading the tar installer, but now I’m using the prebuilt Docker image and I’m liking the isolation and reproducibility it provides. To use Data Collector with MapR, the mapr-client package needs to be installed on the Data Collector host. Alternatively (emphasized because this is important) you can run a separate CentOS Docker container which has the mapr-client package installed, then you can share /opt/mapr as a Docker volume with the Data Collector container. I like this approach because the MapR installer (which you can download here) can configure a mapr-client container for me! MapR calls this container the Persistent Application Client Container (PACC). For more information about creating the PACC image, see https://maprdocs.mapr.com/home/AdvancedInstallation/CreatingPACCImage.html. # MAPR_DOCKER_ARGS="-v /opt/mapr --name mapr-client"
Start the Data Collector Docker container with the following command. 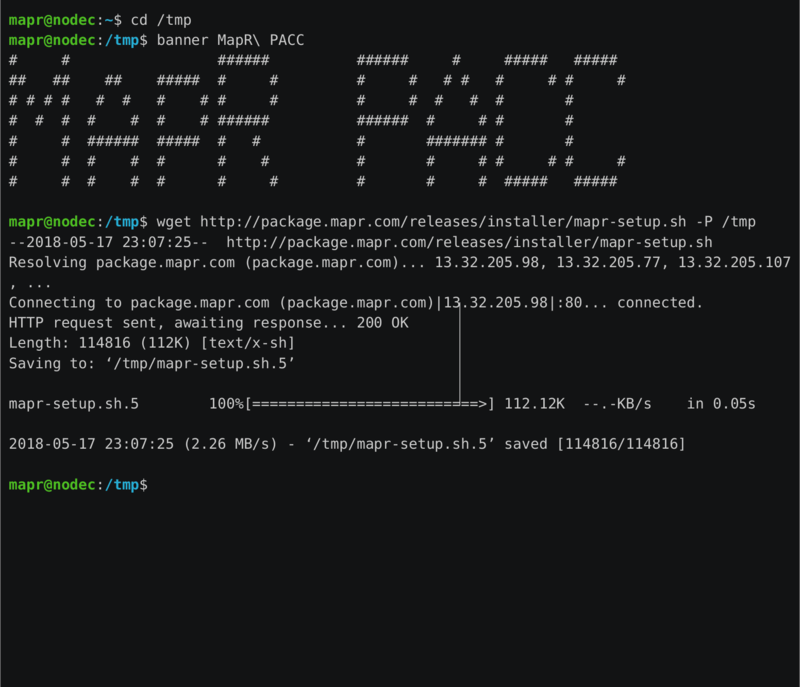 Normally we would need to install the MapR client on the Data Collector host, but since we’ve mapped /opt/mapr from the PACC via Docker volumes, the Data Collector host already has it! You’ll want to install the first one, “MapR 6.0.0”. That package lets you use MapR filesystem, MapR-DB, and MapR Streams. If you want Hive and cluster mode execution, then install “MapR 6.0.0 MEP 4” as well as “MapR 6.0.0”. If you want Spark, then also install “MapR Spark 2.1.0 MEP 3”. After you install the package, don’t forget to run the setup-mapr script and all that jazz as described in the setup guide. Restart Data Collector again from the gear menu. Please provide your feedback to this article by adding a comment to https://github.com/iandow/iandow.github.io/issues/11. Thanks, Ian, for a great explanation! If you'd like to contribute a guest post on anything StreamSets-related, please get in touch.